For a solution that always matches the application, there are many pressure sensors to choose from, with accuracies of up to 0.025 % and measuring ranges up to 6,000 bar (87,000 psi), which can be interchanged quickly and without tools. In addition to being fixed to the pressure calibrator, the reference pressure sensor can, optionally, be used externally via an approx. 1.2 m (4 ft) long connecting cable. 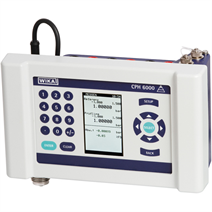 If the reference pressure sensor on the instrument is changed, then the digital indicator will recognise the new measuring range and so this saves the operator from having to configure it via the menu. In the setup menu of the pressure calibrator there are 3 operating modes to choose from: MEASURING, CALIBRATION and PRESSURE SWITCHTEST. In the CALIBRATION and PRESSURE SWITCHTEST modes, a menu assistant supports the user during each operation and records, for example, the calibration data from several calibrations or automatically calculates the switch hysteresis. To power the test item and to read its measurement signals, there are electrical inputs and outputs which are protected from adverse conditions in the field by captive protection caps. 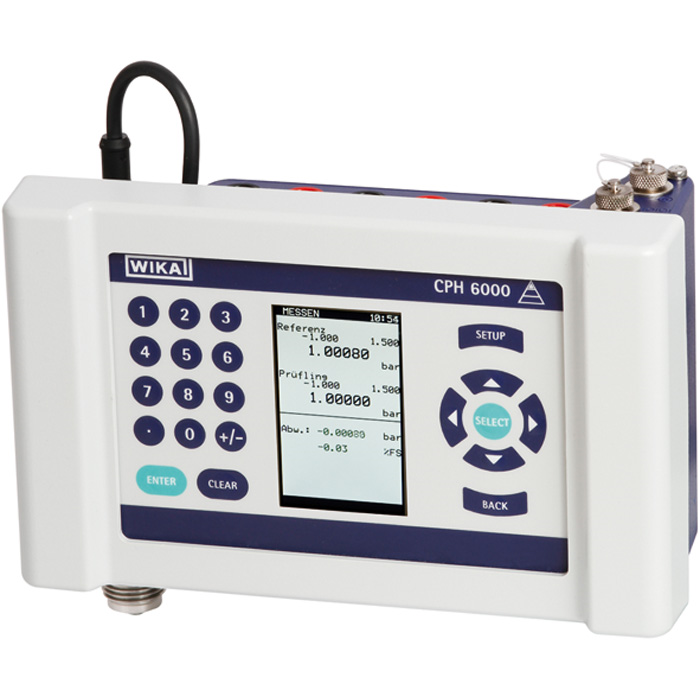 For the evaluation and documentation of the calibration data stored in the pressure calibrator CPH6000, WIKA-Cal calibration software is available. Using this software, the data is automatically transferred into a printable calibration certificate. Furthermore, WIKA-Cal also offers, over and above PC-supported calibration, the management of the calibration and instrument data in an SQL database. For data transfer, an RS-232 and a USB interface are available.